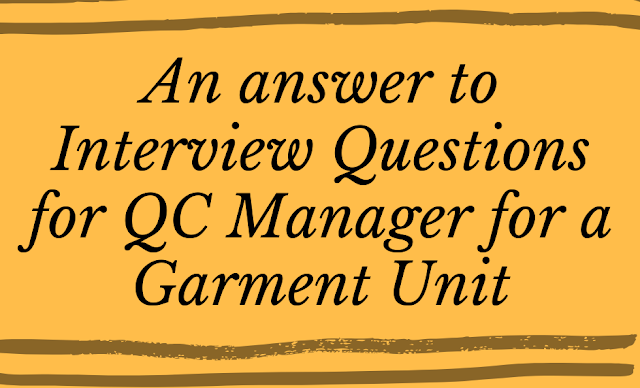 In an earlier post, I had published questions asked in the quality control job interview. Today, I will post answers to those questions. Answers to some questions are subjective and depend on the actual situation of your work experience and learning. I will try to explain the possible answer to all these questions. The answer will help you to be prepared for your next interview. As you are applying for the QA manager position, I am assuming that you already know the apparel quality control system. To read the answer click on the question. 1. What kind of products have you handled in past? There is no fixed answer to this question. You need to tell the types of garments you handled in the past and you are currently handling. If you are already working in a garment factory, you know what kind of apparel products you are making. You just need to name those products. For example, Shirts, knitted tops, ladies dress, woven blouse, trousers, suits, designer dress etc are example different types of apparel products. 2. How do you manage quality in the cutting room, sewing floor and finishing section? Explain the way you used to manage cutting room quality, stitching floor quality and finishing section garment quality in the current factory. You can answer this question this way – in the cutting room, you inspect patterns, marker and after cutting you check cut panels randomly for its shapes, cutting quality and fabric defects. In sewing line, you check garment inline checkpoints, random checking of a garment at all operations and end-of-line checking is done. In the finishing stage, initial finishing checking is done prior to pressing and after pressing final finishing inspection is done. If you prepare a quality checking report, and analysis quality report data, you can put those points as well. 3. How many quality checkers is needed in a 500 machines factory in stitching floor and finishing section? It depends. You can reply to this question based on the current factory quality checkers number. Further for your information, if the factory size is different and different types of products are made by the factory, you need to derive quality checker requirement for a 500 machines factory. Here is an example for calculating quality checker requirement. Note that depending on the product type, calculate machine requirement per sewing line (this an IE’s task). Once you have a sewing line number, you can calculate quality checker requirement as follows. The number of inline checkers required depending on the critical operations (which depend on the product and style). Let’s consider 1 in-line checker per line. Additionally, you need cutting section quality checker and fabric checkers. In the garment finishing stage, checker requirement will vary depending on the daily production quantity and garment quality made in sewing and processing. One checker can check 200-250 garments per day (8 hours) in the finishing stage. Calculate the total number of checkers in the finishing section according to your production volume. 4. As per your experience, what are the primary reasons for quality issues in cutting, stitching and finishing department? -Reasons for stitching defects and handling defects. For your reference read this post. 5. What kind of inspection system you would prefer to set up on the sewing floor? Answer of this question is subjective. If you think the current quality inspection system you used in the factory is a good and effective one, you can suggest the same inspection system. In case you have more ideas for the better quality inspection system for the sewing floor, you can discuss that also. If you are new, note the following possible checkpoints for sewing floor. 6. I have heard other factories follow the traffic light system. What is that? Can we implement that tool? If you know the traffic light system for quality control in the shop floor, explain it to the interviewer. Traffic light system for quality control in roving quality control tool used in checking garments at all the operations and sewing workstation when operators are on the job. If you are not aware about this system read the post on traffic light system and gain knowledge about this. 7. What are the primary KPIs for quality control department? I have written a post on key performance indicators (KPI) for the quality control department. Read that article for detail information. In case you are measuring a different set of quality control KPI, you can share those with the interviewer. Acceptable quality level (AQL) is a common tool used for quality inspection in the apparel industry. Hope you already know about AQL system and AQL chart. Read more about the AQL Chart. 9. What would be your strategy to improve quality level in production departments cutting to finishing? - Implementing 5S and lean tool for reducing defect generation in the process. - Fabric should be checked thoroughly and issue only acceptable fabrics. By eliminating defect generation at the source, quality of the product can be improved. 10. Do you know about problem solving tools and their use? Can you implement those tools in our factory to eliminate quality issue from the root? Commonly used problem-solving tools are - 5Why and Fish bone diagram (Cause-and-Effect Diagram). Explain how these tools are used or can be used in resolving garment quality issues. If you know how to use 5Why and Fishbone Diagram, you can implement the same in a garment factory. 11. What kinds of defects are found in knits, woven garments? You can list down defects that you frequently found in the garment you/your team checked. This is not a difficult question, you can be prepared with the ready list. 12. What kind of defects found in woven fabric and knits fabrics? The garment defects are different from the fabric defects. Yes, fabric defects may be found in the garment. This happens if you do not check fabrics thoroughly and remove defective fabric rolls during fabric checking before cutting. You can cut a partially defective fabric, but you must remove defective cut panels (garment components) having fabric defects. See the list of defects found in knit fabrics and woven fabrics. 13. Do you know the application of 4 point system for fabric inspection? Can you explain to me what does 4-Point system means? Read the post for the guide on 4-point system for fabric inspection. 14. Do you have experience working woven and knits or both? Reply to this question that as per your experience. You have 3 options (Woven garment, knitted garment and both types of garments) which is already mentioned in the question. 15. Different between audit and inspection? Can you conduct internal shipment audit? Inspection is the task that quality checkers do checking of all garments, checking of fabric lots, checking of cut components. Inspection is done during process by following standard method. In inspection or checking, you segregate good pieces and defective pieces. The defective garments are repaired and further inspected before moving to the next process. Inspection of the garment is done the daily basis. On the other hand, an audit is inspecting the process is correctly followed. An audit is done to check the reliability of the quality process, check checker performance, assess the quality performance level of the factory. In the apparel industry, for the shipment audit, based on AQL chart number of garments from the offered shipment and checked and an audit report is made. In auditing, auditor declares a result either shipment is passed or rejected. 16. Do you have any idea about cost of poor quality? Total money a garment factory can save if there is no quality issue in the products at all is the cost of poor quality. Cost of poor quality can be explained in another way - the total money factory spends to make the product up to an acceptable quality level. Money spends on a garment and material inspection, quality checkers' training and in labour for repair work. Watch this video and this article for more information about the cost of poor quality. Related: How to calculate the cost of poor quality? 17. Can you implement quality system in our factory? How much time it would take to implement quality system in our factory? Show your confidence on the job and let them know that you can successfully implement a quality control system in a garment factory. If required learn garment quality management system (QMS), quality control tools and quality improvement strategies. It takes time for implementing a system in a readymade garment factory. With a good team and top management support, the basic quality control system can be implemented in 6 months. (this is my answer). You should tell your answer - How much time you need for setting up the quality control system. 18. What is the areas buyer look at in terms of product quality when they audit the shipment? Primarily buyer looks for the quality that they need as per product techpack. Buyers look for product visuals, garment FIT and measurement. All the checking is done based on the approved sample. Further, they inspect garment packaging and carton labelling at the final inspection stage. 19. What is statistical quality control (SQC)? Can you implement SQC in sewing floor? For the statistical quality control in the garment factory, you can use one of the 7 tools of quality control. Normally, check sheets for capturing the quality data, control chart for data analysis and cause and effect diagram is used in statistical quality control. Explore more on SQC on the internet. You will find many good resources for SQC in the apparel manufacturing sector. 20. What is 7 tools of quality control? Following are the 7 tools of quality control. Hope you find the answer helpful. As part of quality job interview preparation, also go through some quality control manuals (from Buyers). In a quality manual, a lot of information available for learning for beginners. Related: How to improve apparel product quality? Questions for apparel QA manager job preparation. QA manager’s responsibilities in a garment factory. Answer to 20 questions for quality control.